One of the things I love about staplers, mechanical calculators and typewriters is the incredible amount of engineering and inventiveness involved with them. You look at what’s available today and everything looks and operates the same, but it hasn’t always been that way. This stapler is a great example of that. For me this epitomizes the genius behind these everyday devices. The Trigger Action Stapler is a medium-duty office stapler that uses modern standard staples. This is a very well-built machine weighing 2 pounds and measuring 7”L x 2.125”W x 5.5”H. While mechanically more complicated than most staplers, the unique trigger design means that regardless of the amount of force used to depress the trigger that force is converted to a specific amount of mechanical energy so that neither too much nor too little force is used when stapling. This improves stapling results while reducing to almost zero the number of wasted staples. There is a lot of thoughtful design that was put into this stapler. The Trigger Action Stapler was invented by Edward Krantz. He applied for the patent for this item in 1936 and was granted patent 2154755 in 1939. The label on this stapler states “PAT APP’D FOR” from which it can then be assumed that this stapler was made sometime between November 1936 and March 1939. 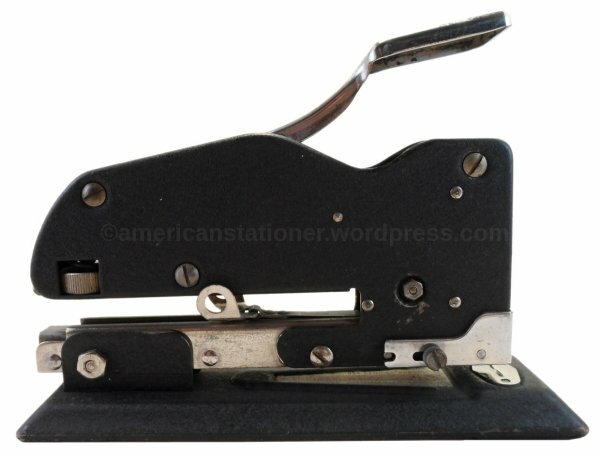 While it is possible that the Trigger Action Stapler was made for a longer period of time it is unlikely and I am reasonably sure it was no longer in production in 1947. However, another patent, number 2310530 for “Anvil for Stapling Machines” uses the same illustrations as in patent 2154755 and both were applied for and granted to Edward Krantz. As this patent was granted in 1943 and it utilized the same illustrations it could be argued that it meant that this stapler was still in production. But that’s a shaky argument at best. 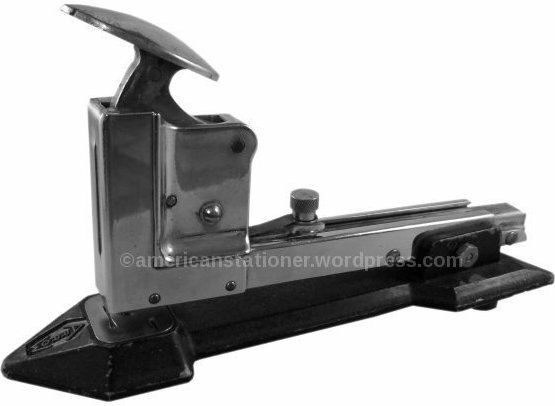 The Trigger Action Stapler was manufactured by the Fastener Corporation which was founded in 1935. By 1947 Fastener Corporation changed its name to Duo-Fast, a name you may have heard of as it is still in business and still makes various types of fasteners. As the label on the stapler shows it being made by Fastener Corp. and I have not seen any evidence that this was manufactured under the Duo-Fast name, it can be reasonably assumed, as stated above, that it was no longer being manufactured by 1947. Edward Krantz invented a number of fastening devices, most of them more for commercial/industrial use. Notably he holds patents for hammer staplers and tackers and his two office staplers that he had made (this being one, the “Krantz” by Krantz Mfg and “Kling-Tite” by Hansen Mfg being the other) show that heritage in their design. It would be my guess that the Trigger Action Stapler wasn’t made for very long because of its complicated mechanical nature, not because of quality or other issues. The large number of moving parts likely necessitated a higher price than its competitors which folks weren’t willing to pay. My personal design tastes tend toward the industrial and this stapler exemplifies the term. Its unique look paired with its utilitarian nature gives it a surprising and unexpected sculptural quality. It must be difficult to make something as utilitarian as a staple remover cool, but Jac Zagoory Designs have done it. 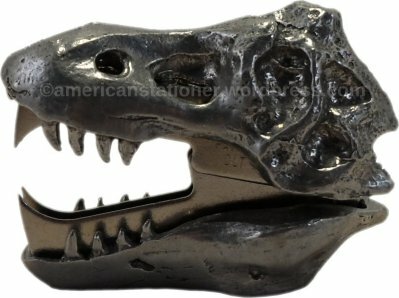 The T-Rex Skull Staple Remover is an amazing item from a company that specializes in amazing office tools. The T-Rex skull is solid pewter permanently attached to a steel staple remover. Weighing-in at a hefty 5.5 ounces and measuring 2.5”L x 1.25”W x 1.75”H. Both the pewter skull and staple remover are made here in the U.S.A. This is still sold today making it a modern office item. It is produced and sold by Jac Zagoory Designs, a company that has been making these types of items since 1995. You can find this and their other items for sale on other specialty sites as well. While information is sparse, it appears that they have been making this remover since approximately 2006. It will cost you a heart-stopping $78. Still, you are getting an extremely high quality piece that is as much a piece of art as it is an office implement. And there’s the rub. This is the kind of item that everyone looks at and says “wow!”, but it doesn’t actually do all that well in removing staples. Perhaps I’m being picky, but for $78 I want my staple remover to remove staples. The issue with this item specifically is the “lips”. The forward edge of the T-Rex skull protrudes approximately 1/8 of an inch beyond the staple removing “teeth”. This effectively means you can’t place this against a piece of paper and remove a staple. What you can do is hold the paper in the air, then place the remover against the paper where the “lips” can fold back the paper a bit so the “teeth” can grab the staple. It is awkward and often results in ripped paper. So here’s my recommendation; if you need a staple remover go to your local office supply store and buy one for 78 cents and you’ll be happy. If you want something mundane that has been turned into a piece of art then get it. I mean, $78 for a miniature sculpture isn’t that bad because that’s what this really is. Check out Jac Zagoory’s other offerings here. I have a number of their items and I can testify that they are universally cool and extremely well-made – and most of them do the job they were designed for really well. 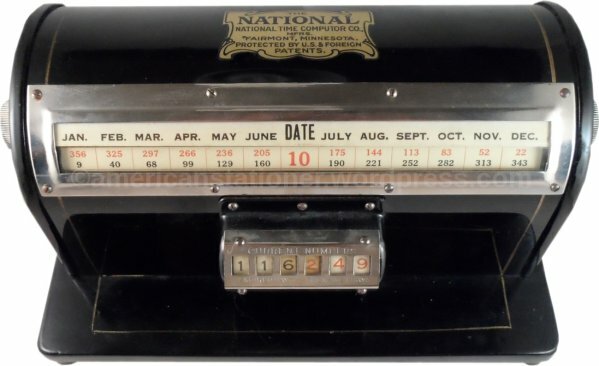 One of the more interesting, and rare, items in my collection is the National Time Computer. This is a device that is used to determine the number of days from one date to another or to determine the date from a specified number of days from the chosen date. It is mechanical and consists of a main cylinder encased in a metal shell with a smaller dual counter mounted on the outside. It is meant for desk top use and measures in at 9.75”L x 6.75”W x 4.75”H. This is an item for which there is no information that I could find on the internet. Finally I came upon a reference to a similar machine in a book titled “Antique Office Machines: 600 Years of Calculating Devices” (Thomas A. Russo, Antique Office Machines: 600 Years of Calculating Devices, 1st edition, Atglen, PA, Schiffer Publishing Ltd, 2001). On page 122 of this book is the same device but built by the H.H. Allison Company of Sac City, Iowa. However, it was just a picture with no further information. Knowing the name of this company I took a chance that it was named after the inventor and started some new research. This turned out to be a correct hunch because the time-computer was indeed patented by Henry H. Allison. He was awarded patent 1237271 in August 1917. He started the H.H. Allison Company and the time-computer was one of the products he originally sold. I assume that some time later the patent was either licensed or sold to the National Time Computor Company of Fairmont, Minnesota. The label on the National Time Computer states that it is patented so I feel I can safely state that this item was made after 1917. My time computer even has an additional cylinder for leap years. At first glance you may think that this isn’t a very useful item, but you’d be mistaken. There are many professions and organizations that would find this to a great time-saver. Government agencies, lawyers, banks and real estate come to mind. A fairly new acquisition to my collection, the Arrow 200 has quickly become one of my favorite staplers. When this model was being sold it was the top-of-the-line model for Arrow Fastener Co. This 200 has a chrome-plated body with a black painted arrow-shaped base, is well-built and when the plunger is depressed makes a very satisfying clicking/whirring sound as it staples. It is also deceptively heavy coming in at 1 pound 5 ounces. The stapler is 7.5″L x 2″W x 4.25″H. This bad boy was made for the company president with some serious stapling that needed to be done! There is very little information about Arrow staplers of any kind. Quite honestly, I initially found the model number of this one only after seeing an old scanned ad on the internet. There are no patent numbers or dates on this stapler. The word “Arrow” is cast on the forward part of the base and on the bottom of the base it states Arrow Fastener, Inc. New York, N.Y., Made in U.S.A., Pat. Pend. That isn’t a lot of information to go off of. It does appear that this stapler is at least based on patent 2205709. This is the patent for all the Arrow model staplers in the ad, but the patent illustration closely matches the A-44. There are some style differences between the 200 and the patent illustrations but they are relatively minor. It is likely that the model 200 was introduced as a larger and more upscale version of the A-44. This patent was filed in 1939 and granted in 1940. One of the keys at this point is the ad I mentioned above. The ad shows the 200 along with other Arrow staplers available for sale, specifically models 203, 105, A-44 and 11. Therefore, I know that the 200 was made in the same time period as these models. Models 203, 105 and 11 all show patents 2205709 and 2312142. Patent 2205709 was filed in 1939 and patent 2312142 was granted in 1943. Therefore, I think it’s reasonable to assume that the 200 was made sometime after 1943. This certainly fits the design of the stapler. Also, the pricing on the ad, it’s style, and the lack of a modern zip code leads me to believe that this was published in the early 50’s to early 60’s. Recently I obtained a 1954 Arrow Fastener Company brochure which shows all the models available for sale that year. In this brochure it shows a picture of the model 200 and specifically names it as such. Along with the models listed above is shown the Model 202 (and several industrial and construction staplers) meaning all these models were available at the same time for at least a while. So I can state unequivocally that the model 200 was available in 1954. Further research leads me to believe that the model 210 replaced the model 200 as the flagship stapler for Arrow. As such I would estimate that the model 200 was available sometime between 1943 and 1959 but unlikely any later. Executive style staplers are always made in smaller numbers and the model 200 seems to have had a shorter run than most. Also, many of the examples I’ve seen are in very poor shape, which is unfortunate. This is a great stapler and is one of the coolest I’ve ever seen. If you find one in decent shape my advice to you is scoop it up instantly.